My buyer and seller clients appreciate my honesty, candor, and humor throughout the process. I'm very detail oriented, and make sure that every last detail in the homebuying and homeselling process is completed, always keeping my client's priorities in mind. I have assisted hundreds of buyers in finding their perfect home. I have lots of expertise with all types of buyers: first-time, move-up, empty-nesters, and relocations. I am also a power listing agent. I am dedicated to helping sellers determine their proper selling price, marketing their home effectively utilizing multiple marketing methods, and ensuring the home's best features are properly highlighted. I've lived and worked in South Metro Denver for over 35 years! I married my best friend, Erik, in 2004, and we've been living our dreams ever since. We enjoy entertaining friends and family at our home in Castle Rock. We have three dogs: Pickles (a Papi-Poo), Fonzie (a big white dog who is scared of his own shadow), and Bonnie (a fox look-alike). We are saltwater aquarists and have a 120-gallon system, as well as a 29-gallon nano cube. We recently became PADI certified scuba divers, and we love to explore the oceans as well as the tropical locales attached to them. If you are in the market for a real estate agent, I’d love to apply for the job! 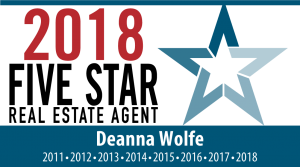 Winner of 5280's Five Star Real Estate Agent Award: Every Year from 2011 to 2018! What do all those letters after my name mean? Those are education designations that show I am continually learning new things and growing in this industry.